Dr. Giovanni Cucchiaro joins Johns Hopkins All Children’s Hospital as director of the Chronic Pain Program. Johns Hopkins All Children’s Hospital named Giovanni Cucchiaro, M.D. as director of the Chronic Pain Program in the Department of Anesthesia and professor of anesthesiology and critical care (pending academic review) with the Johns Hopkins University School of Medicine. His expertise includes pediatric anesthesia, pain management and palliative care and he most recently served as the director of pain and palliative care services at Children’s Hospital Los Angeles. 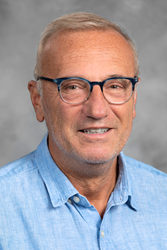 After earning his medical degree from the University of Milan in Milan, Italy, Dr. Cucchiaro completed an internship at Wilson Memorial Regional Medical Center in Johnson City, New York. Dr. Cucchiaro completed a residency in general surgery at the University of Milan and an anesthesia residency at Health Science Center SUNY in Syracuse, New York. He also completed a pediatric anesthesia fellowship at The Children’s Hospital of Philadelphia, Pennsylvania. Dr. Cucchiaro also holds a masters in international public policy and management from the University of Southern California. His clinical research interests include the safety of short and long term use of opioids, addiction prevention and use of complementary intervention to assist children with acute and chronic pain.